HONG KONG - For the second time in 24 hours, the Malaysian national anthem echoed across the 40 competition lanes at the South China Athletic Association Bowling Centre, this time in celebration of the team's doubles victory at the 2018 World Bowling Men's Championships. 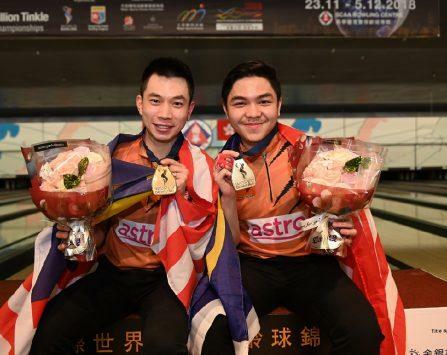 Adrian Ang and Tun Hakim outlasted top-seeded Andrew Anderson and EJ Tackett of the United States, 433-370, to claim Malaysia's third men's gold medal in World Championships competition. The first was in trios in 1979, and the second came Saturday night in Hong Kong as young left-hander Rafiq Ismail ended the four-decade drought by winning this year's singles title. The Malaysians were clean Sunday through the first five frames of the doubles final and built a lead of nearly 30 pins, before Hakim helped them pull away for good with four consecutive strikes in frames five through eight. After a 10-strike semifinal performance, the 19-year-old right-hander and World Championships first-timer, notched six strikes in the final on the way to a 228 game. Ang, a 30-year-old right-hander making his sixth World Championships appearance, added three strikes after a sixth-frame split and finished with 205. "This means so much for us, especially because it had been 39 years, way back, since our seniors had won our last gold medal," Ang said. "Yesterday, Rafiq was able to win, but we tried not to think about that. We wanted to deliver and make good shots. And, if the shot was good, we hoped the result would be, too." Ang and Hakim earned their spot in the championship match with a 458-412 win against Canada's Dan MacLelland and Francois Lavoie, the reigning doubles champions at the World Games. Hakim opened the semifinal with five consecutive strikes, before a 2-10 split ended his run. He bounced back with another five strikes and a 262 finish. Ang contributed a 196 game to the win. Just as he did in a lopsided win in the singles semifinals Saturday, MacLelland started striking mid-game, but it wasn't enough. He finished with a 228 game, and Lavoie added 184. "I feel amazing, and I'm speechless," Hakim said. "I just tried to stay calm during the games and make good shots. We trust each other a lot and communicated well with each other and the coaches." The Malaysian men's history at the World Championships also includes silver medals in doubles (2010) and team (2006) and bronze medals in trios (2006) and Masters (1979). Team USA entered the 2018 World Men's Championships as the defending champions in doubles and team and stepped onto the lanes Sunday looking for a sixth men's doubles title, having previously won in 2017, 2013, 2008, 1991 and 1963. Anderson and Tackett were dominant in their semifinal victory against Korea's Park Jong Woo and Kim Kyung Min, who had three opens between them in the first two frames. Tackett closed with eight strikes and led the balanced effort with 259, while Anderson added a 236 game for a 495 total. Kim paced the Koreans with 189, and Park, a doubles champion at the 2014 World Men's Championships, contributed 188 for a 377 total. When Anderson and Tackett returned to the TV pair for their meeting with Malaysia, they proceeded with the same game plan that yielded success in the semifinal, but it didn't take long to realize a new strategy was needed. Anderson didn't strike in the first four frames of the final, made a ball change and was able to get comfortable, but the early deficit proved to be too much. He finished with a 174 game, while Tackett tossed a late double and finished with 196. "This definitely is frustrating, but something we can take information from and apply it to our medal match tomorrow," said Anderson, who earned a bronze medal in singles Saturday. "We've just got to figure it out as a team and go after it. The first four shots of the final tonight were just me trying to figure it out, and you can't give a team like that a four-frame head start. We have to come in prepared for anything and have a couple different game plans by the end of practice." As they have all week, the competitors are bowling on the 38-foot World Bowling Los Angeles oil pattern, but each time they see it, it can be different than the last. Anything from how many bowlers are on the pair of lanes to how long the practice session is can change the way the pattern transitions. "My look wasn't as good in the final as it was in the first match, but I also made three really bad shots on the right lane that cost us," said Tackett, who averaged nearly 237 in doubles qualifying. "I made the right move later in the game, but it was too late at that point. Those guys bowled a really good game and did exactly what they needed to do to win." Anderson and Tackett received silver medals for their doubles performance, while Korea and Canada each received bronze medals. The United States and Korea will have a shot at redemption Monday in the trios, where they'll meet in the semifinals. Korea earned the top seed after six games of qualifying, and the Team USA team, which includes Anderson, Tackett and fellow World Championships first-timer Kyle Troup, qualified fourth. The other trios semifinal will feature No. 2 Indonesia and No. 3 Sweden. "It feels great to get into medal matches, which is the goal coming in," Tackett said. "Losing is tough, but it's something to build on. We learned some things tonight, and we just need to apply that tomorrow in trios. Hopefully, we can make some better shots and get through the first match again. Then, really bring some good focus and apply pressure early, which is what you have to do in any situation to be successful." Next up at the SCAA Bowling Centre is the final three games of team qualifying for the top half of the field after Saturday's opening three-game set. Competition will resume Monday afternoon, followed by the championship round for trios at 6 p.m. (5 a.m. Eastern). The bottom half of the field bowled its final three games of team Sunday. Additionally, the top 24 bowlers from the all-events standings will advance to Masters match play.